XL Video is supplying nearly 400 square metres of LED screen, plus 72 VersaTUBE LED battens and crew to Blink TV for the UK and European legs of One Direction’s ‘Take Me Home’ world tour. This sees the UK’s favourite chart-topping, multi-platinum selling and award winning band reach dizzying new heights of popularity, presence and profile. The Pixled F-12 and F-30 screen has been specified by the tour’s production designer Paul Normandale, who’s worked with XL on many previous occasions including Coldplay’s 2012 ‘Mylo Xyloto’ tour, when he first used the then just launched F-12 surface. "It was faultless," he comments, adding, "It’s always a pleasure dealing with Phil Mercer and XL – everything is very smooth and easy!" Phil Mercer (project managing for XL) says: "I really enjoy our on-going relationship with One Direction and with the tour’s production director Steve Levitt and production manager Karen Ringland of Production North. Apart from that, it’s great to see the band keep breaking records!" XL initially worked on One Direction’s first full production tour last year. With over 11 million Twitter followers, 15 million Facebook fans, 1.5 billion YouTube views to date, two hit albums and numerous number one singles, One Direction’s short and stratospheric career is über impressive by any standards. The vast upstage LED wall on this one is built from 205 panels of Pixled F-30 totalling a striking 189 square metres. The stage area is 84 ft wide and so Normandale needed a large surface at the back to emphasise the show’s epic proportions. Downstage of the back screen are a series of 11 skyscrapers – each one different in size - made up from a total of 499 x F-12 tiles – 180 square metres in total. The towers are both single and double sided, with some flown at right-angles forming Normandale’s eye-catching cityscape design. 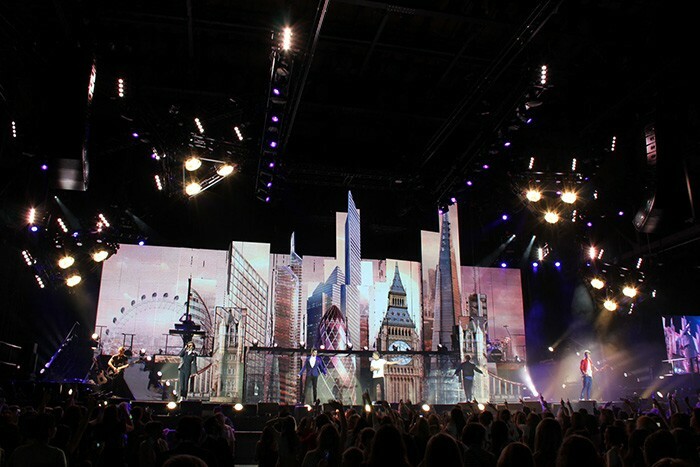 A number of them move up and down on a Kinesys automation system to provide stage entrance / exits for the band (Niall Horan, Zayn Malik, Liam Payne, Harry Styles and Louis Tomlinson). XL devised some ingenious custom metalwork and packaging for the video-towers making them highly efficient to rig, fly for the show and be transported. They pack down into extra-wide dollies for expedient packing in the truck. This streamlining was necessary due to the very tight get-in schedules which have to accommodate a myriad of matinee shows in addition to the evening ones, so everything has to be rigged and ready-to-rock in superfast time. The F-12 towers will be shipped to all territories on the tour itinerary. Playback content for the LED was produced by Canadian video and animation studio Geodezik, and is fed to the LED surfaces via a bespoke media server system supplied and run by Tom Levitt. The towers and back screen also receive camera IMAG footage which is directed by Luke Levitt. To funky-up the underside of the flying bridge that flies in and transports the band from the main to the B stage, XL has supplied the 72 HD VersaTUBE LED battens. XL’s crew of three – Patrick Vansteelant, Philip Leech and Conor Canwell – work alongside six others making up the full touring video department. One’s Direction’s artistic director is Beth Honan. Dave Lee is the lighting director on tour, Mike Shepherd is the lighting crew chief and lighting equipment for the UK and European sections is being supplied by Lite Alternative. The tour continues in Europe, then visits the US and Australia. It’s currently scheduled to finish in Tokyo in November.